People ask me for updates on the race. Here it is in a nutshell: Romney’s winning. He’s winning big. He’s winning the early voting by seven points, even though that was where Obama was supposed to have a huge advantage. He’s up in Ohio. He’s raising boatloads of cash. National polls have had him above fifty percent for over two weeks. And Gallup reports that Republicans will have a 2% advantage at the polls this time as opposed to the 12% advantage the Dems had four years ago – a colossal 14-point swing that will make all the heavily oversampled pro-Democrat polls look pretty foolish. Against the mountain of evidence that Romney’s headed for a landslide victory, you have – wunderkind Nate Silver of the New York Times, who seems increasingly dippy with each passing day. So now that Romney’s winning, the fight is on to figure out a way to delegitimize his victory. How to do that, you ask? The myth of voter suppression. It’s the Republican-backed voter ID laws that are keeping all good Democrats at home. And then there’s our old pal Michael Moore, whose latest slice of bile warning of Republican perfidy features very foul language, spoken unexpectedly by very, very old people. Be warned. Heavy vulgarity ahead. Does anyone think this little piece of offal actually helps the Obama campaign? If so, please explain. It’s lost on me. It strikes me as a colossal embarrassment and a sure sign of desperation from the Left. But what it does demonstrate is that the new narrative is that Mitt will have stolen this election by means of voter suppression. All this makes for a tantalizing conspiracy theory, but it bears no resemblance to the actual facts. The same principle holds in Indiana, which has strict ID requirements and has seen the number of black voters double between 2004 and 2008. Study after study has demonstrated that such laws do not suppress turnout among the populations that Doonesbury thinks it does. So if Republicans are really trying to use these laws to keep minorities from voting, they aren’t doing a very good job of it. Critics also maintain that such laws are unnecessary, since voter fraud is rarely prosecuted. But those complaints ring hollow during this election cycle, when a congressman’s son was caught on film orchestrating the impersonation of 100 voters in order to fraudulently alter election results. Voter fraud is difficult to catch because, in many ways, it’s the perfect crime. Once a ballot is cast, it’s completely untraceable, and it becomes impossible to separate the real votes from the fakes. Voter ID laws are a common sense preventive measure to ensure the integrity of our elections, and they don’t keep anyone from voting. A rather uneventful exchange, methinks. This debate was like the last debate, only more so. That is to say, nobody changed any minds. If you liked your guy at the beginning, you liked him even more at the end. It was ultimately pointless. Which means, in the only way that matters, Romney won. I grow weary of people who try to say one guy or the other won “on points.” What points? Who keeps score? What are the rules? The only thing that matters is how people vote. After three debates, it’s crystal clear that Romney changed millions of votes with his masterful appearance in the first contest. Those who point to flash polls that claim Obama won Debate #2 are forced to ignore the fact that Obama’s actual poll numbers have gotten worse since last week’s encounter. Those same people insist that Romney “lost” tonight, and I hope their scorecards provide them with some consolation as the momentum Romney has been gathering these past three weeks continues unabated. The debate itself was more than a little silly. A foreign policy debate that wasted time on Massachusetts education reform really doesn’t matter much. The only thing that has mattered in these debates is whether or not Romney looks like an acceptable alternative. He does. He did again tonight. None of Obama’s barbs managed to change that, and he has no real chances to legitimately alter the dynamic of this race. He can try bombing something, and perhaps he will, but that will look so extraordinarily desperate that I can’t see it working. Bob Schieffer moderated intelligently and fairly. I’m kinda bugged that Romney let Obama skate on Benghazi, but that was probably wise. He doesn’t need to damage Obama any further than Obama has damaged himself. He just needs to look like he’s up for the job. He does. He will win handily. And I’m pretty both Mitt Romney and Barack Obama know it. The next two presidential debates will have no decisive winner. Obama is too smart and too savvy to repeat the catastrophic performance of last night in his next two outings, and now, with a major drubbing behind him, expectations play solidly in his favor. Romney will be stellar, but Obama will push back, and in the end, it won’t be enough to convince Chris Matthews to put the noose back around his neck. This debate was actually what I expected the first debate to be, and, indeed, was typical of what most presidential debates have traditionally been. In other words, both guys did well, and both sides could walk away thinking their guy won. So it’s unlikely this had a major impact on the trajectory of the race, which is good news for Mitt, since the trajectory continues to favor him. The Obama that showed up wasn’t the lackluster Obama from Denver, which heartened his supporters. The problem for the president, however, was that the Romney who showed up was the Romney from Denver, a Romney radically at odds with the greedy outsourcing granny killer that has been showing up in hundreds of millions of Democratic ads all summer long. Those who were startled to discover that Romney is an acceptable alternative to a failed president saw nothing last night that would have dissuaded them from that position. For Obama to get traction from this debate, it wasn’t enough for him to do well; he needed Romney to do poorly. Thankfully, Romney didn’t oblige. I’m deeply disgusted, however, with “moderator” Candy Crowley “fact-checking” Romney on Libya mid-debate, only to be forced to correct herself afterward when it was pointed out that Mitt got it right. And was anyone else bothered by the fact that the so-called “undecided” voters burst into applause as the biased moderator took a cheap shot at Romney? The upside to this, of course, is that now Libya will dominate the news discussion until next Monday, which is not helpful to the president’s cause. Interesting sidenote: Frank Luntz on FOX had a focus group of undecideds that swung overwhelmingly to Romney after the debate. I was more than willing to wrote that off as a strange outlier tainted by FOX’s conservative slant, but this morning, I find out that MSNBC had a focus group that did the same thing. That surprises me, as I didn’t see anything in that debate that would have changed any minds one way or the other. Perhaps a second strong Romney performance, however, was necessary to persuade true undecideds that Mitt is the real deal. I’ve been asked by my sons’ scoutmaster to watch tomorrow night’s debate with my 11-year-old sons and the rest of the Boy Scout troop and provide my expert advice. Should be fun, but I’m on pins and needles, as I’m more anxious about tomorrow night than any other night in the campaign. Tomorrow night is the only night Romney can lose this thing. All but the most diehard partisans now recognize that this race has slipped away from the president, and that Joe Biden’s toothy meltdown sent thrills up MSNBC legs but didn’t stop the slide. Barring some cataclysmic event, the Romney momentum will continue to build and the Romney landslide will proceed as scheduled. Tomorrow, however, could be that cataclysmic event. It probably won’t be, but that makes it worse. When things are going this well, I always get nervous. All signs point to another Romney victory tomorrow, which makes me counterintuitively think that perhaps Romney and company might be getting cocky. But, that said, let me tell you why they have reason to be cocky. Romney went into the first debate with expectations in the cellar and a media waiting to call it for the prez before anyone said a word. Romney was far better than expected; Obama was far worse. So what are the expectations for this next debate? Hard to tell. It’s kinda weird. First off, everyone expects Obama to do a lot better. But how does he accomplish that, exactly? The president himself chalks up his tumble in Round 1 to his being too “polite.” If that’s really what he’s thinking, then he’s setting himself up for failure. Town halls are a far more difficult venue in which to spew bile the way Biden did while sitting across the table from his opponent. And angry, shrill, whiny Obama isn’t going to play well with moderates and independents, although he may keep Rachel Maddow from intentionally defenestrating herself. His problem in Round 1 wasn’t that he was too friendly; it was that he had no defense for the indefensible. And since Round 1, Benghazi has morphed into a full-fledged disaster for the president, and attempts to blame it all on Romney are pathetically feeble. His record stinks, and he’s not going to better defend it if all he does is amp up the nastiness. The “liar. liar, pants on fire” approach doesn’t work well when the guy you’re accusing can calmly and confidently correct you. And, again, Benghazi has been a parade of lies that has been marching into the living rooms of America for the past month. So if Obama just aims for Romney’s non-flaming trousers in an attempt to roast rhetorical marshmallows on them, he’s going to lose. Expectations for Romney are skewed, too. The message from the first debate should have been that this guy is not to be trifled with, which would have raised expectations sky high for him this time around. But most lefties refuse to acknowledge that, because that would require them to recognize that Romney is not, in fact, the love (hate?) child of Thurston Howell and the devil himself. So instead, they insist Romney won by means of Satanic interference, and that it was his brazen dishonesty coupled with Obama’s ineffectuality that won the day for him. So they discount Romney’s competence even as it stares them in the face. In addition, they maintain that the town hall format is ill-suited to Romney’s style, when Romney has actually been holding successful town hall events all year long. This also ignores a harsh reality that no one seems to notice; the prickly, aloof, out-of-touch candidate in this race is not Mitt Romney, but Barack Obama. Where are the indications that he’s warm and cuddly? He’s used to being worshiped, not challenged. All that considered, tomorrow looks like another good night for Romney, perhaps one good enough for him to put this whole thing to bed. So you can see why I’m worried, can’t you? This morning, I was recounting what I thought of last night’s debate to a woman who became frustrated that I wasn’t saying anything about Paul Ryan’s performance. Enough about Biden, she kept asking; how did Ryan do? But you couldn’t say enough about Biden. The debate was all about Biden. So here’s the deal. If you went into that debate furious with the GOP, and crestfallen because the president let Mitt Romney slide to victory on a blizzard of lies, then Biden was your guy. He was pointed; he was nasty; he wouldn’t let Ryan get a word in edgewise. He giggled and laughed his way through the whole thing, even as they talked about things like Iran getting a nuclear weapon (*Ha ha! Ho ho! *) or diminishing job growth (*Hee hee! Stop it, you’re killing me!*). It wasn’t a debate; it was a Biden-bile yuk-fest. If that’s what you were hankering for, then the veep won, no contest. I can’t imagine anyone else seeing it as anything but reprehensibly and inexcusably rude. But what does that matter? Ryan, Romney, and the Republicans deserve to be shouted down. All they do is lie anyway. They want to destroy the planet, confiscate your womb, starve old people, murder Mexicans, nuke Arabs, and “put y’all back in chains!” Respect in the face of villainy is no virtue; rudeness in the face of evil is no vice. We’ve come a long way from 2000, when audible debate sighs from Al Gore were enough to derail his candidacy. Biden didn’t just sigh. He cackled. He snorted and sniggered. I half-expected him to break out with a string of armpit farts. Is there a single Republican who could have gotten away with an adolescent display like that? I find it disturbing that Democrats not only excused that performance but actually embraced it. So how did Ryan do, in the face of all that? Fine. CNN’s flash poll afterward gave him the victory, 48 to 44 percent. CNBC said he won, 56 to 36 percent. CBS’ poll of undecided voters gave Biden the edge. In the end, all that means absolutely nothing. Frank Luntz held a focus group of undecideds and asked how many of them had changed their mind about the race as a result of this debacle. Not a single one of them raised their hands. This contest threw some read meat to a desolate lefty base, but it was unwatchable for everyone else. 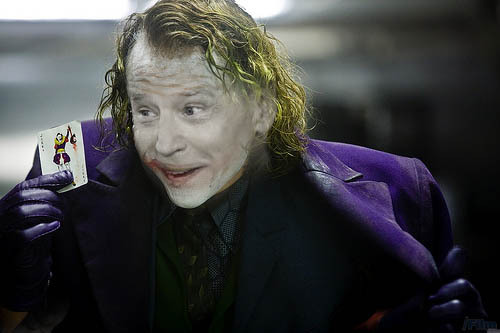 Indeed, the early ratings indicate that it was seen by half as many people as 2008’s Biden/Palin lovefest, which featured a far more measured performance by the Joker without his makeup on. It didn’t move the needle at all, even though Mr. Biden’s Wild Ride undoubtedly unnerved people who think sanity is a prerequisite for the Vice Presidency. Curiously, however, Biden literally didn’t used the word “literally” once. Perhaps he was too busy literally beating his chest to literally hold the future in his hands. By the way, I can’t remember a single thing either one of them actually said. On its face, that’s a noble sentiment. A pluralistic society shouldn’t encourage the slander of anyone, least of all the founder of one of the world’s great religions with over a billion adherents. But the devil, so to speak, is in the details. It just so happens that faithful Muslims consider any depiction of the Prophet Mohammad to be slander, even one intended to be complimentary. So while Christianity is replete with depictions in every media of Jesus himself and the most sacred stories of the faith, there is no parallel artistic tradition in Islam. And, really, how could there be? How does one recount the history of such a vital religious movement when the foundational figure, the star of the story, isn’t allowed to show up? Believe it or not, that hasn’t stopped people from trying. 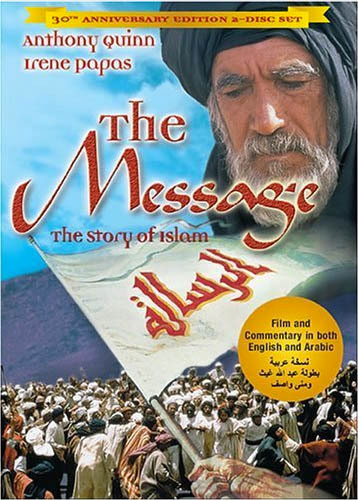 In 1976, an Islamic filmmaker named Moustapha Akkad produced and directed a major motion picture titled Mohammad, Messenger of God, released as The Message in the United States. It starred movie legend Anthony Quinn as – Hamza, Mohammad’s uncle. The taboo against physical portrayals of Mohammad extends to all members of his immediate family, too, so Hamza was the closest relation that Akkad could give any screen time. Islamic custom requires that Mohammad be neither seen nor heard, so the prophet couldn’t appear via voice over, either. Instead, his presence was symbolized by a stately musical theme played on a pipe organ. People speaking to Mohammad would look directly into the camera, and as the soft organ music swelled, characters would repeat verbatim what Mohammad was supposedly saying. Despite all of these dramatic challenges, many critics hailed the film as both respectful and moving and a remarkable introduction to a faith widely misunderstood in the Western world. Yet there were still riots. Rumors had swirled during production that either Charlton Heston or Peter O’Toole had been cast as Mohammad, and neither was considered an acceptable casting choice. Riots and death threats plagued the film’s production, which took a staggering seven years to complete. When the film was finally released, a number of Muslims were still under the mistaken impression that Quinn was playing Mohammad, not Hamza, a misunderstanding exacerbated by the film’s poster, which showed Quinn’s bearded and stately visage floating above legions of Muslims riding off to war. The movie was decried with the same kind of furor now seen in protests against a piece of YouTube garbage, and it was banned entirely in most Arab nations. Prior to its premiere in Washington, DC, an extremist group seized a Jewish community center, took 150 hostages, and threatened to blow the building sky high unless the premiere was cancelled, which it was. Theatre chains, not eager to encourage riots at the local moviehouse, stayed as far away from the film as possible, which resulted in a paltry box office take and no further attempts to make a positive film about Islam’s history until 2008, when another Muslim filmmaker announced plans for a remake. Given current developments, such a film ever seeing the light of day seems increasingly unlikely. And, from my perspective, that’s very unfortunate. A positive movie about Islam would fill a huge void in a popular culture that views Islam with misunderstanding and mistrust. It would also be an invaluable educational tool for a society that has learned more about Moses from Cecil B. DeMille’s “The Ten Commandments” than it has from the book of Exodus. People of good will, then, agree with the president and don’t want a future that “slander[s] the prophet of Islam.” But it’s very hard to move toward such a positive vision when so many Muslims view both slander and respect as the same thing. Look, it’s not complicated. America’s had a lousy four years, but they still weren’t willing to abandon Obama until they were comfortable with the other guy. The debate made them realize Romney’s a more-than-acceptable alternative, so now the president finds himself swimming upstream. Simple as that. Romney’s new poll numbers aren’t a bounce; they’re a seismic shift. In record numbers, voters discovered for themselves that the real MItt bears no resemblance to the Monopoly Man caricature that the Obama-ites have spent hundreds of millions of wasted dollars creating. So regardless of what happens in the debates going forward, or how hard Obama tries to get you to believe him instead of your lying eyes, there’s no going back to Grey Poupon Romney. Although it’s almost comical to watch Obama try. Does anyone believe, for instance, that in an era of massive economic uncertainty, unemployment, and unrest abroad, that undecided voters are going to cast their votes based on the fate of Big Bird? The job numbers were supposed to turn it all around for Obama, and, indeed, the media has been doing yeoman’s work to try and make that happen. But economic data doesn’t move the electorate as much as it impresses the talking heads. I learned that on the Friday after the Democratic Convention, when the catastrophic September jobs report came on the heels of Obama’s acceptance speech. I was sure it would squelch any Obama bounce. It didn’t. Neither, despite much wishful thinking on the part of MSNBC et al, has this statistically anomalous 7.8% unemployment figure done anything to replace the fallen bottom of the Obama campaign boat. 7.8% eliminates the “40 months above 8%” talking point, but it’s still a terribly depressing figure, and everything else in that report was awful, too. Job creation has slowed for three months straight as we continue to march like lemmings off of January’s fiscal cliff. People aren’t impressed with the figures when they’re living with the economic realities, which remain unyieldingly lousy. All this has stopped the gloating among most of my lefty friends, but some stubbornly cling to wunderkind Nate Silver as proof that Obama is going to pull this out. Nate Silver, curator of the New York Times’ much vaunted 538 election forecast blog, made quite a name for himself with his analysis of baseball stats, and he has applied a very sophisticated model to predict the outcome of the 2012 election. To bolster claims of Silver’s infallibility, 538 acolytes point to his impeccable track record of predicting the outcomes in 49 of 50 states in 2008 accurately, along with picking the winners of all 35 senate races in the same year. Currently, he insists that Romney’s “bounce” has only marginally shifted the race, and that Obama is still a prohibitive 3-1 favorite to win reelection. So every time I think Romney’s doing well, I’m told to pay attention to Nate Silver, because the race is really over, and if I were as smart as Nate Silver, or at least not so silly as to ignore Silver’s sagacity, I’d know that and would therefore stop making such a slobbering fool of myself. Let’s take a closer look, shall we? Suppose I were to accurately predict the weather for tomorrow. How impressed would you be? I’m thinking not very. Our temporal proximity to tomorrow gives us enough information that most of us, even without meteorological training or satellite data, could safely predict that a 90 degree day won’t be followed by a blizzard within 24 hours. I could tell you that tomorrow would be pretty much like today, and, 9 times out of 10, I’d probably be right. However, if I could tell you, with precision, what the temperature will be a month from now, I’m betting you’d be tremendously impressed. It takes far more skill – and requires far more risk – to make long-term forecasts. Nate Silver isn’t capable of making long-term forecasts. That doesn’t stop him from creating the illusion that that’s what he’s doing, though. After all, if the election were held today, according to Silver, Obama would win handily. But there’s no way to prove that hypothesis, because the election isn’t being held today. And Silver, like any good statistician, alters his numbers when he gets new data, so he doesn’t have to stick by his predictions, even for 24 hours. By the time Romney’s imminent victory is as close to us in time as tomorrow’s weather is, no doubt Silver’s impressive model will have caught up with reality, and he’ll get kudos for calling the race accurately, just as he did last time. Except is there anyone in America who wouldn’t have been able to call the race for Obama over McCain at any time in November 2008? Silver is getting credit for long-term foreknowledge on the basis of his unimpressive and easily imitated short-term predictions. If you doubt that, consider Silver’s long-term foreknowledge in 2009, when he was describing the Republican “death spiral” that would surely spell GOP defeat in the next year’s mid-term elections. Why were Republicans doomed? Because they had voted en masse against a bill subsidizing the transition from analog to digital television. Ummm… what? Does anyone remember that? They surely didn’t in the actual 2010 elections, when Republicans retook the House and made significant gains in the Senate. Of course, Silver’s wacky prediction was forgotten and replaced with his more reliable statements made closer to the actual election. InTrade does the same thing, by the way. InTrade is startlingly accurate on the day before election day, Prior to that, it varies wildly, and, even on election day, it can shift from 0 to 100 almost instantly. The day before McCain selected Sarah Palin as his running mate, InTrade said Romney was 90% likely to be the 2008 veep. Palin was at 0%. Both Silver and InTrade, then, are lagging indicators, not predictors of future events. And, again, there’s no way to verify their accuracy in the weeks and months leading up to an election. Another interesting tidbit about Silver. In 2008, he was employed by the partisan hacks at the Daily Kos prior to the New York Times. It was there that he signed a confidentiality agreement with the Obama campaign in order to gain access to their extensive internal polling. Campaigns guard their internal poll numbers with their lives, and they’re far more reliable than what’s peddled to the public by media outlets. How accurate would your predictions be if you could look at Obama or Romney’s internal polling? Silver, incidentally, has no such access this time around. This is not to accuse Silver of corruption or bias or anything else nefarious. He’s certainly very bright, and I’ve no doubt that he’ll get it right in the end. But it’s foolhardy to assign any weight to his entirely unprovable assertions a month out from the election as if it can compensate for the reality of the total implosion of Obama’s campaign. That said, watch for Joe Biden to do surprisingly well on Thursday, which will provide another thin reed for Silver and Obama supporters to hold on to as the president continues his inexorable sink into the mire. 1. So let me get this straight. We add 114,000 jobs, which is not enough to keep up with population growth, which is precisely in line with analyst expectations that also presumed the unemployment rate would tick up to 8.3%. But then unemployment plummets by almost half a point to 7.8%, the highest single month drop in nearly three decades?! Is there anyone with half a brain who truly believes that’s real or even possible? Of course, that’s not stopping the media from taking it at face value. Will it matter? I doubt it, as the Romney debate victory cleanly stripped the already thin veneer of objectivity off of the talking heads who have repeatedly told us that Mitt Romney is, in fact, Leona Helmsley in drag. Credible voices, beginning with former GM CEO Jack Welch, are stating the obvious – this unemployment figure just doesn’t pass the smell test, and no number of Chris Matthews meltdowns will be able to cover up the stench. 2. I’ve discovered a quirky, delightful new blog called hillbuzz.org, written by someone more confident re: Romney’s chances than I am. He’s coined the term “Eeyores” to describe spineless Republicans who panic on cue, and he posts a “Daily Doom Antidote” that provides exactly what the label implies- solid reasons for optimism about November. Of course, the guy who writes it, Kevin Dujan, is also kind of nuts. He’s a gay conservative who insists that the president is a closeted gay man who had a reputation as “Bathhouse Barry” in his early college days, and he claims to be “this close” to proving it. Good luck with that. It’s kind of fun to read, though, in an Onion-y sort of way. He also insists that Barack is a drug fiend and attributes the president’s debate performance to coming off of a cocaine high. That’s dippy, but not quite as dippy as Al Gore claiming it was the altitude. 3. Speaking of The Onion, they’ve published a “voter’s guide to Mitt Romney” that I refuse to link to, as it includes one of the nastiest attacks on Mormonism I’ve seen in this campaign, complete with a completely out-of-context video snippet of Mormon temple ceremonies. It would be absurd to say that The Onion has “crossed a line,” since the charm of The Onion is that it ignores all such lines, but it’s unnerving to me, in our Book-of-Mormon-on-Broadway age, how comfortably and cavalierly people mock the faith of over 14 million people. 4. Last but not least, saw this commercial on CNN and was reminded that there are more than two candidates in the race. Gotta give Mr. Johnson’s advocates credit – if nothing else, this commercial is not like any other political ad we’ve seen in any election season in memory. Curious to hear your thoughts on it. In other words, I knew I was right, but it scares me that I was this right. The real question is what happens now. Let’s get the unpleasant bits out if the way first. 1. Watch for Paul Ryan to lose the Vice Presidential Debate to Joe Biden. Just as expectations worked in Romney’s favor last night, so do they provide the headwinds for Ryan going up against Crazy Uncle Joe, who is not nearly as stupid as he repeatedly sounds and who is much better at connecting with audiences than the far more wonkish Ryan. Romney’s rout last night did nothing but raise expectations for his running mate, and, barring Biden “literally” screwing things up, Ryan will look aggressive and peevish, while Biden will come off as warm and folksy and not stupid. It won’t be anything like the Obama debacle from this first debate, but it will be more than enough to help Rachel Maddow and Chris Matthews reclaim their Republican-hating mojo. It also won’t matter much or at all, considering, you know, it’s a Vice Presidential Debate. 2. The polls will move toward Romney, but not as much as they should. For all of Romney’s triumphs last night, the one thing he didn’t do was convince diehard Obama supporters to abandon their guy. Current poll methodology continues to be based on a flawed 2008 turnout model, which will bear no resemblance to the flood of energized Republicans and conservative independents who will give Romney a landslide victory on November 6. Consequently, they won’t be represented in the polls to the extent that such polls will reflect just how much the game changed last night. Watch for many a lefty pundit to hang onto the straw that the polls still show a close race, even though their guy is fading fast. 3. The Obama nastiness meter now goes to 11. Obama’s losing. He now knows he’s losing. Anger and hostility get amped up when desperation sets in. And that puts the Mormon card back on the table. A group called “Catholics for Obama” has started making push calls asking Ohio voters how they can support “a Mormon who doesn’t believe in Jesus Christ.” The Onion has released a video “voter guide” to Mitt Romney that includes a snarlingly derisive description of my faith and out-of-context snippets of sacred Mormon temple ceremonies. I still think Daniel Z. was right and that Mormonism won’t really play a big role in this election at this point, but a campaign willing to sanction an ad that claims Mitt Romney gives women cancer isn’t going to flinch at playing every card they possibly can, even from the bottom of the deck. 4. The next two presidential debates will have no decisive winner. 5. Republican enthusiasm, along with the “Shy Tory/Bradley Effect” will end in a Romney landslide that will make this debate loss seem like the best night of Bill Maher’s life. The first four points, in the end, won’t make a difference. Romney won the election last night, and here’s why. Republicans are highly motivated to beat Obama, but last night, they became motivated to vote for Romney. That’s never, ever happened before in this cycle, and it’s hard to overstate how significant that is. Romney was always the best of a number of bad options, and even the very smooth albeit somewhat bland convention didn’t turn the GOP into Mitt fanboys. Last night’s debate, however, did. Giving these guys a positive reason to show up and vote will widen the enthusiasm gap between parties and ensure that Republican turnout will break all records. This will fly in the face of assumptions that now predict that Obama will win even more support from his base than he did four years ago. In 1992, opinion polls in Great Britain had John Major neck-and-neck with his Labour Party opponent, only to have him win a decisive 7-point victory on election day. Pollsters dubbed this the “Shy Tory Effect,” explaining that conservatives were far less willing to tell pollsters their true voting preferences. It’s very likely that such a thing is happening here in the US, especially when you consider the Bradley or Wilder Effect, where black politicians tend to do far worse in opinion polls because voters don’t want to admit they’re voting against the African-American candidate for fear of looking like racists. Obama was supposed to be a transcendent, transformational figure, and even Republican hacks like me cheered the fact that this nation is now colorblind enough to elect a black president. Voters don’t want to admit, at least publicly, that the guy who was supposed to lower the sea levels and heal the planet is really kind of incompetent. But in the privacy of the ballot box, they’re going to have to ask themselves if they really want four more years like the last four years. Last night, Romney gave them permission to vote against the likable, inspiring, yet failed president they supported so eagerly four years ago. All of the above seems obvious to me, and my track record thus far is pretty good. That scares me, too. I wonder if maybe I’ve used up my fair allotment of Chihuahua’s heads. Tuning out of politics for just a few days is very good for your personal constitution. I highly recommend it. Looking at all the opinion pieces from the weekend until now, it’s clear I didn’t miss much. The Huffington Post declared the race is over. Ben Affleck talked about the fact that the Republicans “had a chance,” but now that the race is over, it’s a missed opportunity. But something happened that I didn’t expect. The polls tightened. Not just the reliable polls, but the ones that wildly oversampled Democrats. CNN now has the race in a statistical dead heat, when they had Obama walking away with it just the week before. Same with NBC, ABC, and the National Journal, which, in Nepal [a poll] which oversampled Democrats by seven points, still has the race tied at 47%. Swing state polls are showing a similar tightening, and it’s unlikely that any of the swing states are going to have margins that are wildly different from the popular vote total. Nothing. Nothing at all. This race is exactly where it was before the conventions. We have an incumbent below a 50% approval rating, a challenger that is now neck–and–snack [neck] with him, with about 6% undecided, almost all of whom will end up in Romney’s column by the end of the election. In other words, this race remains Romney’s to lose. Kenny [Can he] lose it? Sure. In fact, if he’s going to lose it, he’ll lose it tonight. But I don’t think he’s going to lose it tonight, even though, or maybe especially though, the mainstream media has already decided that Obama is the debate victor. Expectations for Romney tonight are in the toilet, despite Obama’s best efforts to raise them. He will likely exceed those expectations if his pants don’t fall down. He will also benefit greatly just from sharing the same stage with the incumbent. For the first time, people have the opportunity to measure the current president against the potential one, and they’re going to like what they see. Romney is easily the most articulate, effective presidential candidate the Republicans have had since Ronald Reagan. That goes against the Thurston Howell caricature the media and the Obama campaign have created, but tonight, for millions of general election voters, that caricature will collide with reality.